The great alchemist John Dee designed a protective magical talisman under the direction of the angel Uriel: crossed lines, a central circle, and the letters A, G, L, and A. These letters constitute an acronym (also known as a kabbalistic "notariqon") of the unspeakable primordial name that was lost through the ages. It's a well-kept secret that this talisman can serve as a revealing template for a four-card Tarot spread. We explore the how and why in our guest post for Thematic Tarot. S. writes that she's working on token giveaways to commemorate the sunrise after an all-night fire ceremony, and she has found some beautiful palo santo sticks — fragrant wood which is burned a tiny bit at a time. 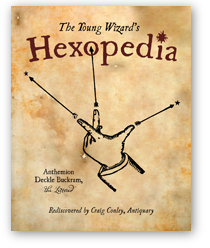 She explains: "We would like to have a magic word that could be burned into the wood, so that as someone burned it away, bit by bit, the word would still have meaning, magic and power, even with one letter disappearing at a time, either from the beginning, or the end." So the burning on either or both ends will create the diminishing effect. Perfection! More on ABLANATHANALBA can be found in our Magic Words: A Dictionary. From Peter Ibbetson, written and illustrated by George Du Maurier, 1892. The Lord of Misrule, magician/comedian Tommy Cooper, sometimes intoned an "incomprehensible incantation of dubious foreign extraction that might have been spelled 'Zhhzhhzhhzhh,' but probably wasn't'" (John Fisher, Tommy Cooper: Always Leave Them Laughing, 2006, p. 6). Photo courtesy of Harry R.
This magic phrase is popularly believed to have originated in Scandinavian folklore. Sim sala bim is “the Swedish equivalent of ‘abracadabra,’” and is known in other Scandinavian cultures as well. Sim Sala Bim is the name of a card trick by Kolin Tregaskes. Orson Welles uses Sim Sala Bim as magic words in the 1967 film Casino Royale. For more about sim sala bim, see our Magic Words: A Dictionary. "Autumn" is one of my favorite words. It sings. The word alone is good therapy.